Product prices and availability are accurate as of 2019-04-16 12:51:43 UTC and are subject to change. Any price and availability information displayed on http://www.amazon.com/ at the time of purchase will apply to the purchase of this product. ZZKKO cycling arm warmer sleeves made of 85% polyester and 15% spandex, quick dry breathable. The premium soft fabrics ensure zero-pilling, outstanding comfort, excellent breathability, high elasticity, superb moisture absorption and sweat releasing of our arm sleeves. The arm sunscreen sleeves fit for most arms, both men and women can wear it. These sun sleeves are seamless.Featured with anti-slip gels inside of which better stick on your skin. Non Slip Elastic Bands on Top and Bottom to confirm the sleeves won't slip from your arms. We make sure you'll be comfortable and happy. It is very easy to slip on and off. In summer, definitely feel cool when these sleeves on.In winter, it can make your arm warmer. This arm cooler sleeve is perfectly suitable for outdoor and indoor activities. Such as running, cycling, fishing, driving, golf, hiking, tennis, basketball, gardening. It also fits for indoor activities with its fast dry materials which let your skin feel cool during sport. Promoteing faster muscle recovery and blood circulation.Offering great forearm protection and minimizes injury. a. Can use a neutral detergent to wash in 30? water temperature. b. Soak for 10 minutes in detergent, cannot be steamed or boiled. c. To make it lint-free, please wash it with hand gently, do not scrub hard, avoid twisting force, do not scrub with brush. 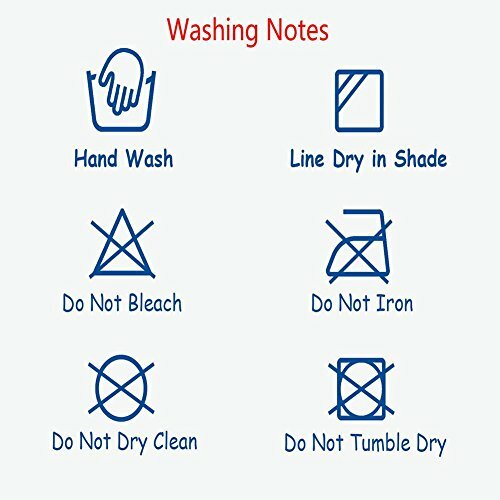 d. Please wash them by hand , not by machine.Line dry, dry in shade. Soft Cooling Protofilament?The uv protection cooling arm sleeves made of 85% polyester and 15% spandex.This is cooler and protect your arm from the strong direct sunlight. 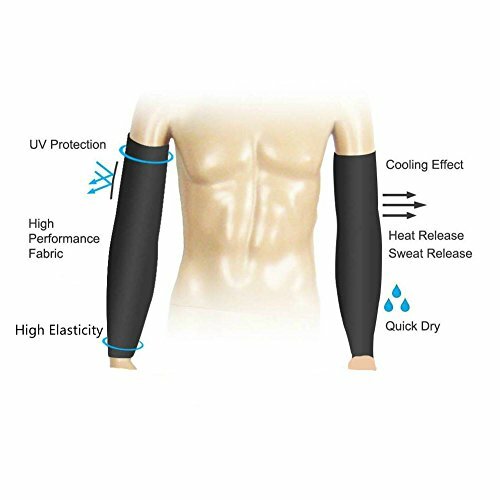 Quick Dry and Breathable: Fast sweat kick-away and fast dry arm sleeves.Keeping your arms warm in cold temperatures and cool in hotter temperatures. 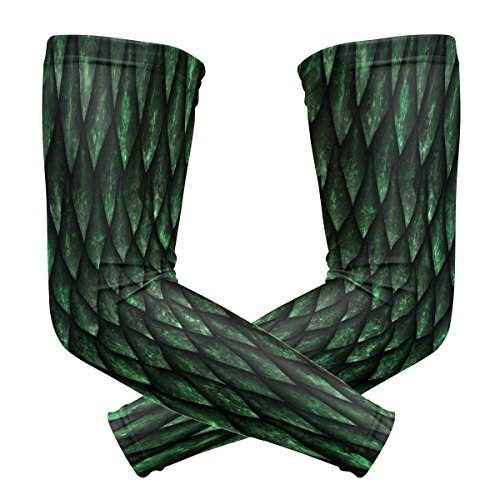 Unisex and One Size Fit Most: Approx 16.5 inch length, suggest fit for upper bicep circumference about 11-14 inches, wrist circumference about 7.5-12 inches.Our uv protective arm sleeves are stretchy enough to comfortably fit most arms.Great for women and small arm framed men.Sold as 1 pair. 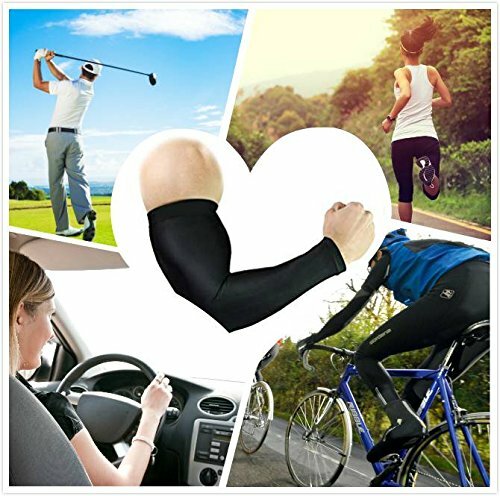 Sports Support: The armwarmers sleeves cover designed by considering all muscle line of body to protect muscle.Promotes faster muscle recovery and blood circulation.Make your muscle feel comfortable when doing sport. 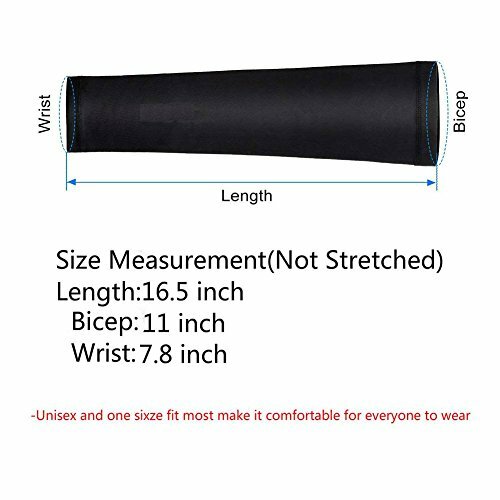 Prefect for Outdoor and Indoor Activities: Our lightweight arm sleeves are perfect for running, golfing, fishing, cycling, jogging, playing basketball, baseball, tennis, climbing, hiking, driving or even gardening and so on.Suitable for Indoor Activities too, even your workplaces.